Price: £8.89 (incl VAT) Sorry, this item is currently unavailable. Click here to receive notification when this product comes back into stock. Contains a unique blend of herbal, non-steroidal, natural anti-inflammatory and local analgesics to calm, soothe and reduce ear pain. How does Earex Pain Relief Spray work? The external ear canal can become infected due to the accumulation of earwax, trapped water, dryness of the skin or foreign bodies in the ear. This can cause discomfort, itchiness and even temporary hearing loss. 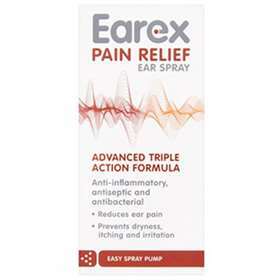 Earex Pain Relief Spray contains a unique mixture of herbal oils known for their therapeutic and beneficial effects to alleviate and prevent common ear problems. Provide an anti-inflammatory and antiseptic effect. Provide antibacterial and anti-infective protection. Treat and prevent fungal infection. Prevent dryness, itching and irritation. Adjust the spray mechanism to a horizontal position and keeping the head upright, place close to the outer ear canal. Press firmly and fully, downwards on the spray pump 1-2 times in each ear. Clear away any excess residue or seepage with a clean tissue or cotton wool. Use three times per day as needed. Children under 5 years of age should receive medical diagnosis before use. Plea Europaea, Sesamum Indicum (Sesame) Oil, Saw Palmeto Extract, Phytosterol Complex, Bisabolol, Murrayya Koenigii Leaf Oil, Cinnamomum Zeylanicum Leaf Oil, Sea Whip Extract, Spearmint Oil. Product code: 4023875 Price: £8.89 (incl VAT) Sorry, this item is currently unavailable. Click here to receive notification when this product comes back into stock.